The world’s first and largest network of grid-scale batteries and rapid chargers are set to revolutionise power distribution across the UK and aid electric vehicle adoption, particularly for fleets. A combined 2GW network of batteries will be installed across 45 sites at electricity sub stations across the country, connected directly to the extra-high voltage system. Each site will be home to 50MW battery installations, capable of storing enough electricity for 235,000 homes together. Together, they can release or absorb the equivalent to two-thirds the planned power output of the Hinkley C nuclear power plant, helping to balance load requirements on the grid. The sites will also support large-scale rapid charging stations that are set to become the largest network in the world. 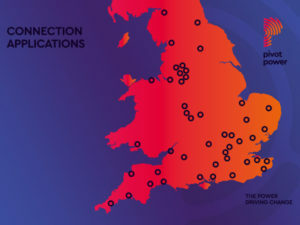 Sites have been chosen near towns and major roads where they can power up to 100 rapid chargers capable of delivering 150kW, and will support 350kW rapid chargers when they come to the UK. The battery installation is being undertaken by Pivot Power, which aims to have 10 sites operational within 18 months, with the first site operational as soon as the middle of 2019. The company says that each site will provide a hub that can support a variety of infrastructure, such as public rapid charging stations, electric bus depots and bases for large transport fleets. The company believes the installation of grid-batteries and marge-scale rapid charge sites will alleviate the three biggest barriers to EV adoption as cited by the Department for Transport, including availability of charge points, distance travelled on a charge and cost. Graeme Cooper, National Grid project director for electric vehicles, said: “We expect the use of electric vehicles to grow rapidly. This innovative solution will help accelerate adoption by providing a network of rapid charging stations across the country enabling cars to charge quickly, efficiently and as cost-effectively as possible. “It will also give the system operator more choice and flexibility for managing the demands in the day-to-day running of the network and also help mass EV charging”.